I'll gladly translate the doc but please let me know the name of the parish where the baptism took place. Knowing the geographical context makes it easier to translate the record. Thanks for the geographical info. Without it I would never have seen the truncated fourth word in the second line as the Latin version of Dzietrzkowice. Surnames are my best, but not certain, interpretation of the handwriting. Just a bit of trivia...the following entry records the fact that the dean of the area checked the entries in the register during the pastoral visitation on Nov. 24, 1730. It has no connection to any of the other entries on the page. Anyway here is the translation. On the 18th day of November (1730) the Reverend Adam Smolnicki, vicar* of the church of Dzietrzkowice, baptized Andrew, the son of the legitimate marriage of Bartłomiej and Maryanna Pawyza. The sponsors lifting (him) up from the holy font were Jan Wandega? and also Agnieszka Gawełczyna(?). Note: vicarius/vicar: Here the meaning is “assistant” priest. The curatus/curate (the pastor who was responsible for “the cure” of souls) appears in several other entries in the image. Sometimes curatus and vicarius are synonymous. Since technically the bishop is the “pastor” of all the parishes of a diocese the priest who is known as the pastor exercises his office as the assistant/helper of the bishop. That is not he case here since the vicarius in this record is the direct helper of the curatus without any reference to the bishop. The parish must have been fairly large to merit two priests. All the above explanation and a dime will get you a transfer on any bus or elevated train in the city, like folks used to say in Chi-town when a transfer did cost a dime. 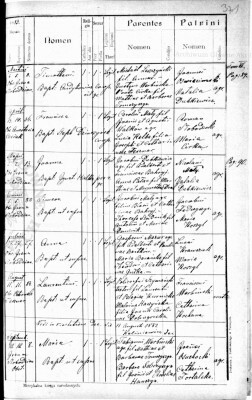 Would someone be able to help me with translating the attached death record from the Varniai parish in Lithuania (1824). Here is the translation of the death record you posted. A suggestion…In the future it would make it easier to read the record if you took a screenshot rather than a picture of the computer screen. The snipping tool works well for that purpose. Also, if you would use Firefox as your browser there is a builtin tool which enables you to take screenshots, enhance the image, save the image, etc. Body of Entry: In the Year of Our Lord 1824 on the 20th day of January the well-born* Felicjan Giedwillo, the husband of the well-born Petronela, 73 years of age, from Lipkalnie, of the parish of Varniai, died after having been fortified by the Sacraments of Penance, Sacred Viaticum, and Extreme Unction **, whose body was buried in the parish cemetery of Varniai. Notes: *Generosus/Generosa: Well-born (Polish: urodzony) = adjective used to describe the owner of at least one village. **Collectively the three were commonly called “The Last Rites”. Viaticum is Communion received on one’s deathbed which was supposed to fortify the person on the way/road (Latin: via) from this world to the next. Hence the first part of the name. Thank you very much. Sorry for the poor picture quality. The standard screen shots that my mac takes exceeds the 2MB size limit slightly (and I'm wasn't savvy enough to change it), so I resorted to my phone. I'll give your suggested process a try next time. On the record/translation. I was looking for the death record for Felicjan Giedwillo (wife Petronella) from Polipkalnie in the Varniai parish - and was hoping this might be it. I guess it isn't. This record is from a Roman Catholic baptism record in Dubkowce, Skalat, which comes from this archive. I think the 2nd entry from the bottom on the 2nd page "Laurentius" is the Latin form of my great grandfather's name Wawrzaniec. His birthday also matches what I already knew, and Policarp Szymanski was on the same homestead as Wawrzaniec in Saskatchewan. So it makes sense that Policarp is his father. I did my best to transcribe and translate the column titles and entries. Any help confirming/correcting is much appreciated. Anything in quotes is a transcription, and question marks indicate uncertainty. "obs" (obsetrix) midwife - Petrovsla Jeszrar? Please attach an image of the original record. I edited the original post to include a cropped image of the 2nd page. Cheers. The method I used to determine doubtful uppercase letters (as in the surname of the midwife) was to compare those letters to letters in known words within the record. Completions of abbreviations and insertions of understood words are in parentheses. Given names are rendered in Polish followed by the English equivalent. Patrini actually means sponsors, the official term for those who are commonly called godparents. In the past I’ve posted a list of Latin given names with their Polish and English equivalents. If you believe that you would find such a list helpful, I would gladly post it again. Note in Col. 4: Bapt(isavit) ut supra = The one as above (Ignat[ius] Halko par. r. gr. = Ignacy/Ignatius Halko, the Greek [Eastern] Rite pastor) baptized (him). I appreciate your help. Your tips about using other areas of the document as a key is something I will put into practice going forward. And if you wouldn't mind, posting that list of Latin names would definitely be helpful. Both my maternal grandparents are Catholic and Polish, so I'm sure I'll be spending a lot of time going through records written in Latin. Could you please clarify some things for me? Since Col. 7b is blank, did the latin word "textor" mean Wawrzyniec's occupation was a weaver? Is "Dobrogorska wrence" a typo? The reason I listed 7b as blank is that the priest used both 7a & b for the text of the entry instead of as the headings indicated. Yes, Dobrogorska wrence is a typo—or more accurately a messed up cut and paste. The line should read “the son of Wawrzyniec/Lawrence (Szymański) and of Pelagia...etc. I really should do a better job proof reading. My excuse is that I was posting the translation while talking to my brother on the phone. Maybe I shouldn’t try to do the multitasking thing. Your summary is dead on accurate. The list of names is not exhaustive. It is just something I put together from names I encountered in my own research and in translations I’ve done over the years. A word of caution about spelling...The Latin given names as found in records admit of spelling variations and thus it is possible that you may not find a name on the list spelled as it is in a document—The female sponsor in the third record from the top is a good example. In the list it is spelled Eulalia (the correct spelling) and Yulalia in the record but it is the same name. I’ll not bore you with a linguistic explanation for how the variation happens. Also, attached is a map of the administrative divisions of Galicia during the early 20th Century. If you have not seen it before perhaps you may find it useful. Sorry for the inconvenience of the typos. Amazing, those are good resources. Thanks again for your help! 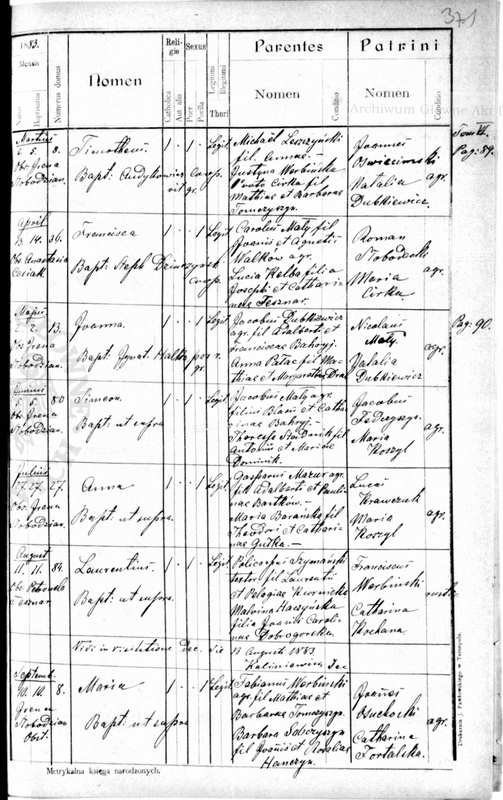 Below are images from two separate marriage registers from the parish of Borowa in Galicia. In each of the records, in the 'Testes' column furthest to the right appears the name 'Simon Skopinski'. Next to his name appears a word with appears to start with 'pater-' It almost looks like 'paterfome'. I couldn't find a definition for this term. I suspect it refers to his relationship with the couple, which would be very helpful as he is my direct ancestor. 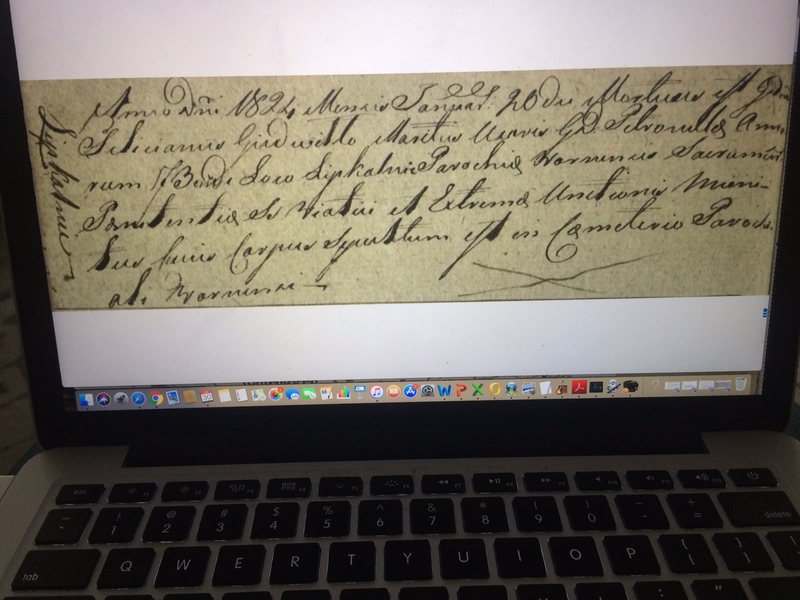 Can someone identify what the words are and what their meanings are in the context of this document?